The Sport-Tek Ladies Sport-Wick 100% Polyester Fleece Pant Style LST237 is available in Women’s Sizes: XS-4XL, and can be purchased in your choice of Black and Dark Smoke Grey. SKU: SM-LST237 Categories: Activewear, Women's Clothing, Ladies Activewear, Athletic Pants, Fleece Clothing Tags: ladies activewear, ladies clothing, ladies workout pants, women's activewear, women's fleece bottoms, women's fleece pants, women's warmup pants, women's workout pants Brands: Sport-Tek. The Sport-Tek® Ladies Sport-Wick® 100% Polyester Fleece Pant Style LST237 is available in Women’s Sizes: XS-4XL and comes in the following colors: Black and Dark Smoke Grey. 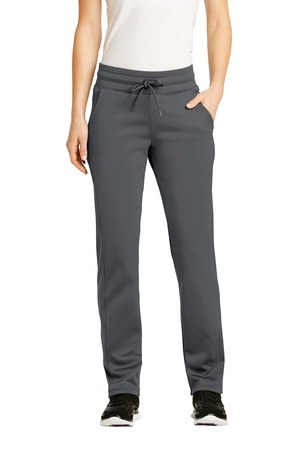 This streamlined, anti-static, moisture-wicking pant has a comfortable waistband and flattering leg seaming details. Coordinates with all Sport-Wick Fleece pullovers and jackets. Be the first to review “Sport-Tek® Ladies Sport-Wick® 100% Polyester Fleece Pant Style LST237” Click here to cancel reply.